Last weekend, I trekked to Western Massachusetts with my mama and our friend Lynn Trotta for an abundance workshop at Dig In Farm. Although Dig In is just a two and a half hour drive from my home in New York, arriving at the permaculture center—mapped by a lush herb garden and chicken coop—felt like a world away. The farm in the forest helped me reaccess the kind of mud luscious and loving world that I want to live in. I want to take care of and feel cared by this earth. I want to give to the soil that feeds me. I want to sleep under the stars and wake up to the sun. We featured Dig In Director Grace Oedel in our most recent print issue of Loam (Grace's words on activating hope will heal your heart). It was such a joy, however, to actually meet her and Assistant Director Juna Rosales Muller. Their playful nature and passion for DIY made this workshop transformative. I'd sorely missed the delicious act of creation. 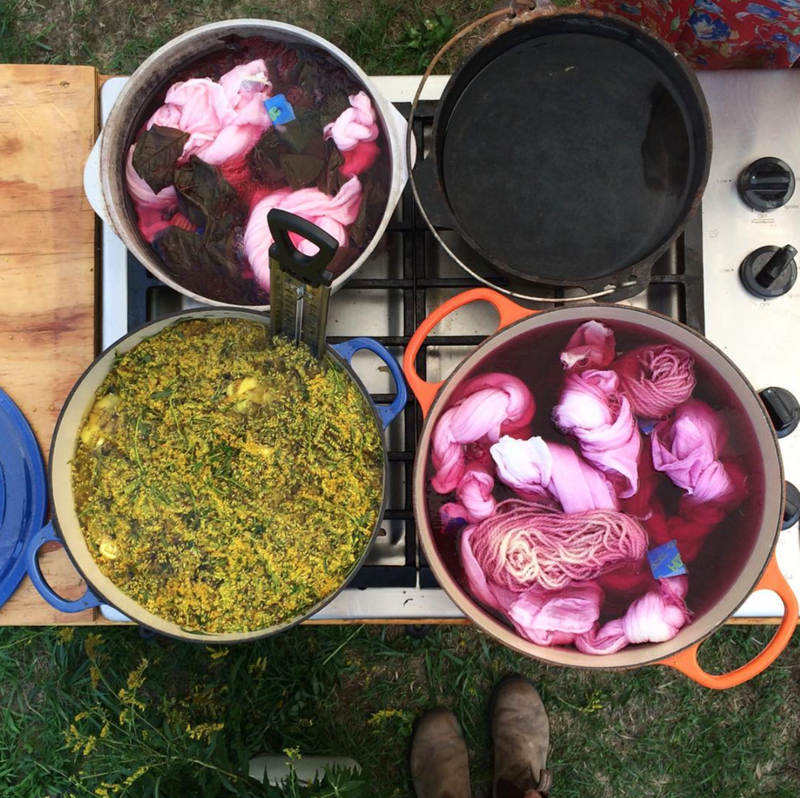 Over the course of a divinely yummy two days, I was able to make—everything from elderberry syrups to borage-infused shrubs to tea towels dyed with goldenrod—at a pretty little picnic table planted in view of Dig In's sun freckled fields. I loved the opportunity to see things through to fruition; to harvest lemon balm by hand for a solar tea, to resee the weeds that grew wild in my own neighborhood as a rich source of color. And I loved too, meeting so many people who rocked my world. Each one of the participants brought something to the table. We talked about flower essences and climate justice and I felt healed. This little ol' heart of mine had been searching for evidence that the life that I wanted was possible. And here it was! Embedded in the tangles of lung-like elderberries and and in the hearts of those who I worked alongside. It was pretty sweet that the simple act of crafting hot sauce by hand could stoke a fire in me. A couple of months ago, Loam launched our Connections Over Consumerism campaign to encourage our community to seek experiences instead of accumulating stuff. If, as the rad Grace Lee Bogs notes, capitalism is dehumanizing, actively creating connections is just the opposite: life-giving. Dig In Farm embodied the life-giving experiences that I want more of in my life—making goodies by hand, being in nature, tending to herbs, sleeping in a yurt(!). I hope that each one of you reading this will be inspired to make your next travel destination a permaculture center. Because when we support sustainable farms and farmers, we multiply the conditions for goodness and green to grow. Our natural and social ecosystems need more love and joy. By bringing an abundance mindset into practice, we can fortify the soil for those very essential qualities to take root. So dig in, loamy loves. There's a whole world out there for you to help heal and be healed by.